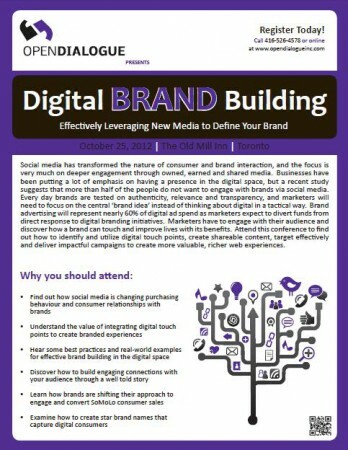 Delvinia President Steve Mast is the keynote speaker at OpenDialogue‘s Digital Brand Building conference being held at The Old Mill Inn on October 25. The theme for this year’s event is Effectively Leveraging New Media to Define your Brand. In today’s world, digital platforms and technologies are constantly evolving, resulting in high consumer expectations and the need to deliver compelling experiences to engage your audience. As a result, many brands are struggling with the same big questions: What motivates the social customer to take action with a brand? What keeps customers loyal to your digital brand? Since so many customers are on Facebook, should it not be your new corporate home page? In this session, Steve will present new data from the AskingCanadians research community about consumer engagement with social platforms. Attendees will learn what Canadians are doing, why and how often, and gain valuable insights into how social media is changing purchasing behaviour and consumer relationships with brands. For more information about the conference, visit the OpenDialogue website. To join us at the event, register here.